The Blonde hottie from the Magic Mike, Alex is no doubt a graceful young actor, whose successful career in modelling lead him to the ‘camera, light and action’ world. He has been into Hollywood controversies many times after making some weird statements about it lately, but the young actor has always been into the limelight due to his handsome look and style. He has god variety of tattoos embedded on his skin. 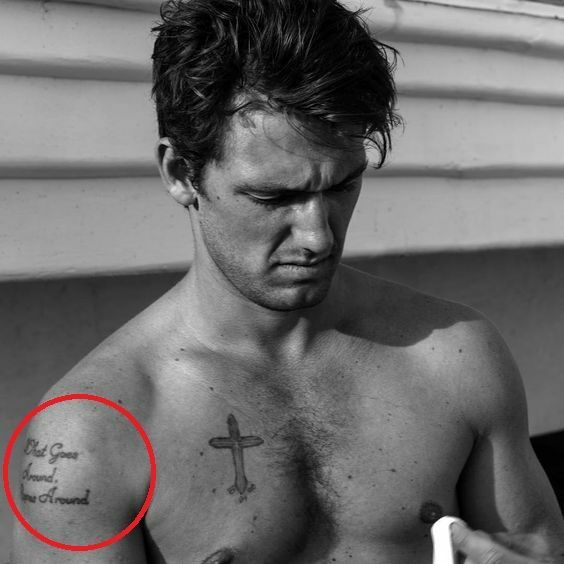 Meaning: Pettyfer has inked a Celtic Cross on the right side of his chest. It is in dark green and blue shades and has a swirling serpent to its lower side. 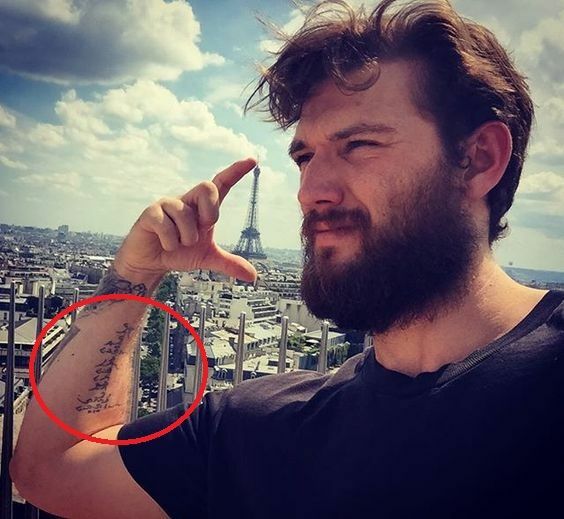 Meaning: Alex has tattooed a Tibetian script on his right forearm. Meaning: Alex has a tiny and beautiful tattoo inked on his right wrist which has two interlinked hearts with letter E and R inside them. ER stands for his ex-girlfriend name Emma Robert. 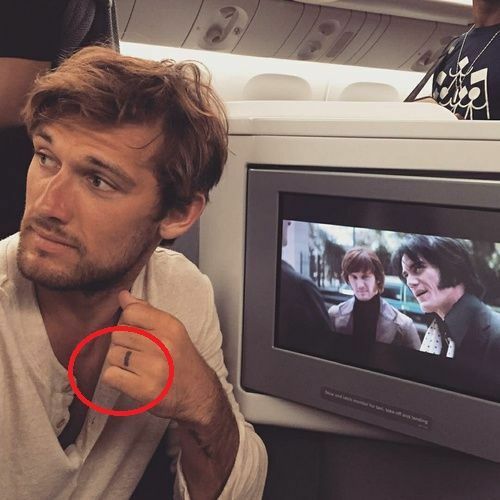 Meaning: Alex had tattooed the name of Emma on his ring finger when they were dating each other. After a few months of dating, they parted their ways. In an interview with Glamour UK, he spoke of no regrets of still having these tattoos inked on his skin. He said, “I got a girl name tattooed on my ring finger because I was in love. We have broken up, but I dont live in regrets“. Meaning: Alex has got his back inked with a massive, intricate tattoo that has covered the majority of his back. He has got this tattoo to promote his production company, Upturn Productions. 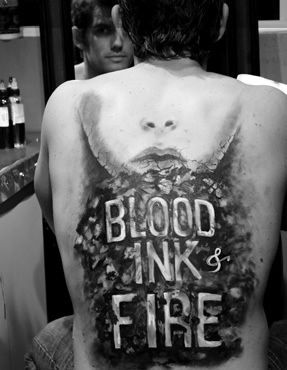 The ink depicts the book title, “BLOOD, INK & FIRE” with the lower half of the women face. Meaning: Alex has tattoed little lamb on his left wrist in beautiful cursive handwriting. Meaning: Alex has a portrait of two children lying on the ground inked on his right forearm. Meaning: Alex has cartoonish depiction inked on his right wrist. 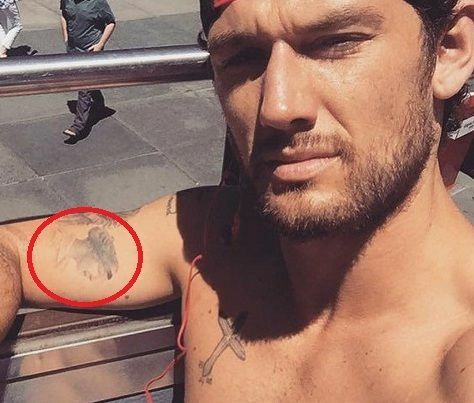 The tattoo has a pig who is watching the sky and a bonfire in front of it. 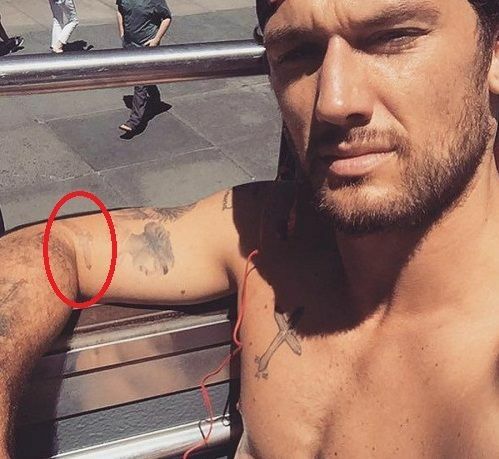 Meaning: Alex has inked a flying bird on his right arm which resembles eagle or vulture. Meaning: Alex has the face of a lady wearing a scarf or a hat tattooed on his inner side of the right upper arm. Meaning: Alex has inked a tattoo on his lower abdomen. The tattoo is in Japanese katakana script which is his name, Alex. Meaning: Alex has tattoed a face of a baby on his left forearm. The Tattoo Artist, Andrew_the_kid ink this tattoo. 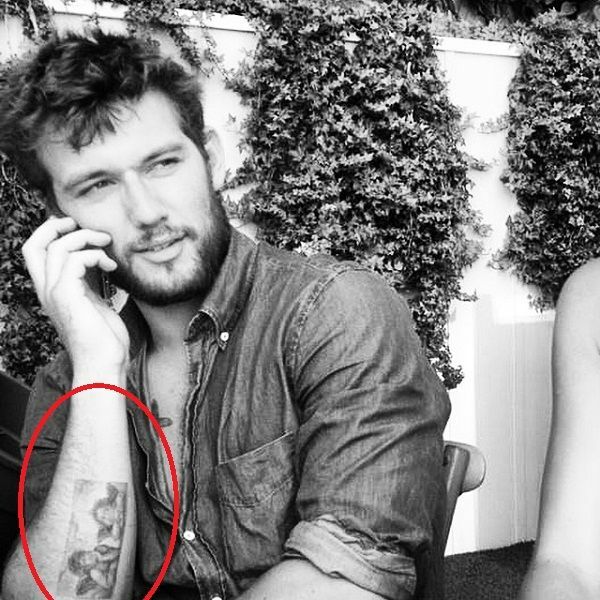 Meaning: Alex has a tattoo of a man sitting on a chair on the outer side of his right forearm.